The first time I saw Chuck Offenburger, he was sitting on the steps of the Evening Sentinel, wearing an old-style leather football helmet, inviting people to pelt him with eggs. I was a high school junior in Shenandoah, Iowa, and Offenburger, now in his 50th year as a journalist, was the youthful sports editor of the local paper. I enjoyed reading his columns and following the local sports teams through his stories. 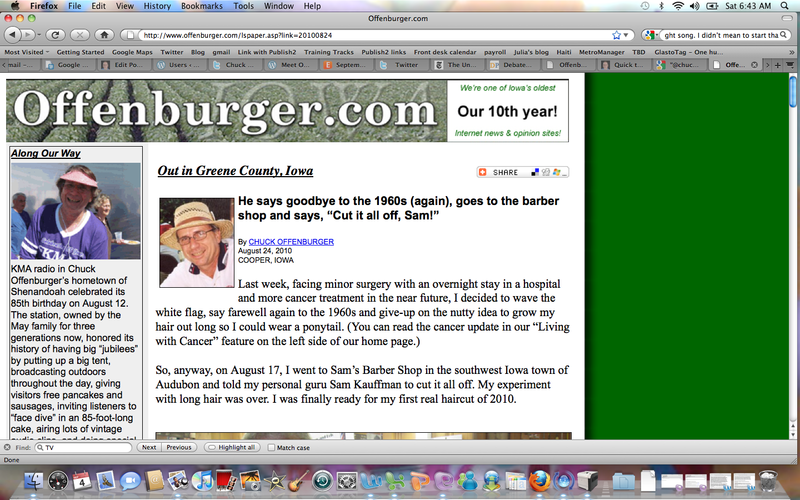 I was interested in being a journalist someday, and Offenburger was the best journalist in our small town. He had made some prediction about how Shenandoah High School’s Mustangs would do that season or the previous weekend, and he had been wrong. Offenburger liked to back his predictions up with the threat of public humiliation. So he was sitting on the steps of his workplace with egg — and a smile — on his face. The following summer, Offenburger was looking for someone to provide coverage — stories and photos — of the Corner Conference, 10 tiny schools in the countryside surrounding Shenandoah. He hired me, launching my journalism career, just over 39 years ago. As I was falling in love with journalism, Offenburger was teaching me its fundamentals. He told me when my stories were not getting to the point quickly enough and helped me learn how to decide and tell the essence of a story. He quickly noted in basketball season my preference for what he called “armpit shots,” the shooting and rebounding photos that tended to be more ball and armpit than face. With his guidance, I started shooting more and better photos that captured players’ facial expressions and varied action: players driving to the basket, diving for loose balls and playing defense. Offenburger also was showing me how fun journalism can be. Even with his advice, I was nowhere near as good a photographer as he was, so he shot the photos of the all-conference teams. We brought the all-stars together at the Essex High School gymnasium. Larry Maynes, coach of the Malvern Pantherettes, joined Offenburger, Essex boys basketball coach Dave Jauron and me for a game of “horse” while his two all-stars, Kathy Leu and Joyce Stephens, were in the lockerroom, changing out of their uniforms after the photo shoot. About that time, Offenburger was in job negotiations with the Des Moines Register. He left shortly after the basketball season to take a job as a Register reporter. I took over as Sentinel sports editor until leaving Shenandoah that fall to start college. While I was in college, Offenburger was quickly becoming a star reporter at the Register. He started as a general assignment reporter, the bottom-rung job where you had to tackle whatever lame story ideas an editor wants to pursue and leftover stories beat reporters didn’t want to take on. He turned it into the plum job of the reporting staff, by excelling with the routine stories and by finding his own story ideas, better than what anyone else was doing. I returned to the Sentinel for internships and after graduation, serving as a news reporter at first, and also helping out the Register as a “stringer,” doing legwork for Offenburger on some stories based in southwest Iowa. I did the reporting for him on a front-page story about a small-claims court case between two neighbors in Imogene, Iowa, fighting over a watermelon patch. In that simple, silly story Offenburger taught me about staying in touch with sources (how did he know about that story from Des Moines when I didn’t know about it in Shenandoah? ), about finding stories in unusual places and about storytelling. A year or so after my graduation, the Sentinel publisher’s wife was criticized at a city council meeting for her leadership of a local organization that received city money. I reported the criticism accurately, but learned from a friend that she was furious and wanted me gone. I began exploring other opportunities. Offenburger was in town for a weekend and I went to seek his advice. In addition to offering sound advice, he said he would see what he could do to get me an interview at the Register. Within a few weeks, I was interviewing with Managing Editor Dave Witke. I wanted to be a reporter. Witke said they might want to start me as a copy editor. I said I was interested in either job. I desperately wanted to get out of the Shenandoah situation and the Register then was one of the best newspapers in the country (Jim Risser had won his first Pulitzer Prize the year before). While I was disappointed to start my career at the Register as a copy editor, not reporter, it was one of the greatest learning experiences of my career. I learned news judgment. I learned how to work quickly. The demanding editors on the copy desk improved my writing, which was pretty undisciplined. Some eight years later, when I was leaving the Register, I asked out of curiosity to see my personnel file. It included a memo from Offenburger to Witke, strongly recommending that the Register find a place for me, but also suggesting, “it might be good to break him in on the copy desk with the idea of moving him into reporting after a few months.” Offenburger knew what I needed, even if it wasn’t what I wanted. By the time I started at the Register, Offenburger had become a columnist, “Iowa Boy.” His job was to roam the state telling the interesting stories of Iowans. The Register was a statewide newspaper then, perhaps the state’s most respected and powerful institution. He quickly became a celebrity, finding fascinating tales in Iowa’s small towns and countrysides and occasionally commenting on statewide issues. Whether he was trying to bring back saddle shoes (his Twitter avatar is a saddle shoe) rating the state’s top cinnamon rolls or telling about getting his ear pierced in middle age, Offenburger touched funny and poignant notes that made him one of Iowa’s most beloved personalities. When I was launching a new project for the Register in Fort Dodge, he was the biggest celebrity we could bring to a promotional event (and he was glad to help out). Over the years, the Register sent him on many prime assignments, covering the Persian Gulf war as well as Iowa connections in South Africa. He became the leader of RAGBRAI, the Register’s famous cross-state bicycle ride, a chance to meet and mingle with thousands of Iowans. I’m sure Offenburger could have left the state for opportunities elsewhere. But he truly was the Iowa Boy, rooted in the state he loved. I left the Register in 1985 and he left in 1998, shortly before I returned for a two-year stint. He taught for a while at a couple small Iowa colleges, Loras in Dubuque and Buena Vista in Storm Lake, before settling down in the country outside Cooper, Iowa. He became an Internet entrepreneur, selling his own books (including one on Iowa girls sports) and other Iowa merchandise at Offenburger.com (and still writing regular columns), as well as writing for magazines and the newsletter of Shenandoah regional radio station KMA. 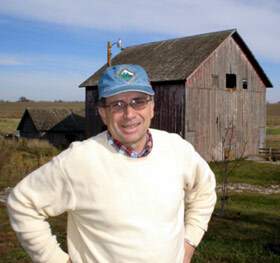 He and his wife, Carla Offenburger, led bus tours of Iowa attractions (yes, Iowa has attractions, to Iowans at least). Last year, an email brought the sad news that Offenburger had non-Hodgkins follicular lymphoma, but his emails and blog posts shared his positive outlook and the initially optimistic prognosis of his doctors. Heavy chemotherapy did not keep him down long. Offenburger was soon back on his bike and sharing encouraging reports. I told him that the 10th anniversary of my cancer surgery passed uncelebrated, because I am so cancer free I didn’t even note the milestone until a few days later. I wished for as carefree a 10th anniversary for him. That was always a bit more sunny than the facts: Offenburger’s cancer was treatable, but not curable. I doubt anyone still battling cancer would go through whole days without thinking of the disease, as I now do. Later, cancer became a double concern for Offenburger after Carla was diagnosed with a malignant jaw tumor and began her own course of surgery and radiation. I know I’m getting great care from the best cancer centers in Iowa. I’ve got Carla, our two kids, all our families and hundreds of friends right with us. Spiritually, I’m right where I need to be – all “prayed-up,” as they say. Now, Thy will be done, O Lord. I’m still planning to celebrate that 10th anniversary (dinner will be on me, Chuck). If optimism and determination can hold cancer at bay, he will do it. Whatever lies ahead, I thank him for still teaching me valuable lessons. As Chuck would say: “good writing!” One of the best things about the journalism profession is the people with whom we’re privileged to work. There are too many workplaces today where friendships aren’t possible. In journalism, they’re essential. We learn from each other, and Chuck is a great teacher. Hello Steve, I stumbled across your story about Chuck O when I googled him after watching a PBS story about the 6 on 6 game of IA girls basketball. It was so fun to watch; it actually captured the spirit & significance of the sport & what it meant to IA “in the day”. Chuck provided some great quotes in the documentary and I wondered what had become of him. I knew that he had gone to the DM Register & started RAGBRAI, but hadn’t kept up with him in recent years. I remembered you when I came across your name in the google list. As I recall, you & Chuck were more than kind in your coverage of the Malvern Pantherettes–we had a special chemistry & still enjoy staying in touch even though we don’t all live in the area. It was very cool to read your story about Chuck’s influence on you; I was surprised, however, when you mentioned the 3 on 3 game –I had forgotten about that!! Mr. Maynes, Joyce & I against the 3 of you!! Hilarious! I believe you befriended Joleen & Coleen Pontow and stayed in touch with them after HS as you figured out your journalism career. You may (or may not) know that Joleen died a few years ago in a car accident–a very special person who died too young. Thanks for the story you shared a about Chuck; I hope he continues to beat the cancer. If you are in touch with him, please give him my best for all he has done for the sport of girls basketball!! Sending a prayer his way for continued strength. I’ll email you his sister’s address, if you’d like to send him a card. I think it was actually Dennis Lloyd who knew the Pontow twins. I don’t think I’ve heard from them in years. But in the small-town way that people in Iowa are all connected somehow, Kim Wederquist was married for many years to the brother of my brother-in-law. Thanks so much for reconnecting.